As a dietary supplement consume 1 serving with 6-8 ounces of water or milk post-exercise. Advanced users may consume 2 servings with 12-16 ounces of water or milk post-exercise. Nutri-Whey can be used in between meals but should not be used to replace a meal. Whey Protein Concentrate, Sugar, Natural Flavors, Columbian Freeze-dried Coffee, Stevia, And Salt. Whey Protein Concentrate, Sugar, Natural Flavors, Freeze Dried Strawberries, Stevia, And Salt. 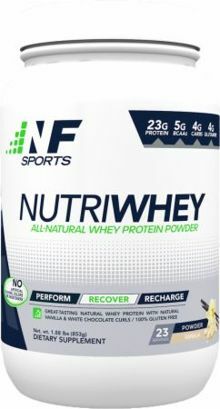 Whey Protein Concentrate, White Chocolate Curls (Sugar, Cocoa Butter, Milk Powder, Whey Powder, Lactose, Soy Lecithin, And Natural Vanilla), Sucrose, Natural Flavors, Sodium Chloride, And Stevia. As a dietary supplement, consume 1 serving with 6-8 ounces of water or milk post-exercise. Advanced users may consume 2 servings with 12-16 ounces of water or milk post-exercise. NutriWhey can be used in between meals but should not be used to replace a meal.